A collection of ten short fiction by one of the best GLBT writers. Tales of love and lust, romance and heartbreak grace each of the pages. You'll hear about coming out and all the challenges that are faced by girls everyday. Read about a girl who sees herself as a "boi", a father her turns her daughter to stone through abuse and a chat room that helps girls get over their heartache. I enjoyed these quick stories and breezed through the book. Julie Anne Peters is a truly great writer who captures the angst of being out and the sorrow of being stuck in. The only one of these little fictions I didn't like was TIAD about a girl who seeks out help from a chat room and ends up falling for one of the other members. It just seemed confusing in the end. I understood what happened, but I didn't enjoy how it was presented.There's not much else to say about this except, if you love GLBT fiction make sure you pick this up. This week's drooling is in Honor of Pretty Dead by my favorite author Francesca Lia Block. Due out September 22nd this is on my read immediately list. "Pretty Dead is about Charlotte, a ninety-nine year old vampire in the body of a seventeen year old girl. Charlotte becomes close to her best friend Emily’s boyfriend, a beautiful “black sheep” named Jared. As their relationship grows, Charlotte must confront her terrifying past, embodied in the person of her maker William Stone Eliot who has come looking for her." So really, how could you not want to read this. She is a genius. Also, that cover is fantastic! This week's Teaser Tuesday is from Green Angel by: Alice Hoffman. "It's the ink, I said. Not me." Luisa Perez is one of 11 other Luisa Perez's at her school. She has no defining talent to help distinguish herself from the others. That is until her English teacher, Mr. Sparling, assigns her an anonymous column in the school newspaper. After the principal of Dunfield (Dumpfield) High announces that the school is to be competing in a Literacy contest against the other schools in the area, Mr. Sparling decides that a Girl vs. Boy column would spark interest from the student body. The prize for winning is an extra long winter break. The student body throws itself into the competition, showing the school spirit nobody knew they had. Luisa writes her column under the alias of Newshoud while her male counterpart uses the code name Scoop. Luisa ends up dating a few guys whom she suspects of being Scoop. She finally snoops around and finds out who she thinks Scoop definitely is. She ends up hooking up with a really nice guy named Joey after many, many Dunfield Duds. Will she tell him who she is before she reveals herself to everyone else at the and of the competition Literacy Gala? Okay while this book was enjoyable, I really could NOT stand Luisa - what a snob. She keeps mentioning how she can't believe everyone thinks she's a snob. I can believe it. Every guy she has an interaction with she's practically all over him. She talks to any male and she just leads into a "relationship" with them. After we get past Luisa being such a ditz however the book is actually a fun read. Predictable, but you still had to read until the ending just to make sure you were correct. I could not stand to put the book down or return it, until I found out everything that was going on. The characters weren't overly developed, but most of them were so shallow anyways it didn't really matter. This book was more "fun reading" then "smart reading" or rather "literature". So if you can handle Luisa whining and her general snobishness I would say read this, it's entertaining. Firstly I got the Goods if you haven't you should go here and get to it! Also I got some I ♥ ♥ bumper stickers. To show your support go here. NATE. Dashing pirate. Will do anything to protect Bertie. COBWEB, MOTH, MUSTARD SEED, and PEASEBLOSSOM. Four tiny and incredibly annoying fairies. BERTIE’S sidekicks. ARIEL. Seductive air spirit and Bertie’s weakness. The symbol of impending doom. BERTIE. Our heroine.Welcome to the Théâtre Illuminata, where the actors of every play ever written can be found behind the curtain. They were born to play their parts, and are bound to the Théâtre by The Book—an ancient and magical tome of scripts. Bertie is not one of them, but they are her family—and she is about to lose them all and the only home she has ever known. Dru Anderson has what her grandmother called “the touch.” (Comes in handy when you’re traveling from town to town with your dad, hunting ghosts, suckers, wulfen, and the occasional zombie.) Then her dad turns up dead—but still walking—and Dru knows she’s next. Even worse, she’s got two guys hungry for her affections, and they’re not about to let the fiercely independent Dru go it alone. Will Dru discover just how special she really is before coming face-to-fang with whatever—or whoever— is hunting her? of “normal” life, Tessa tastes new experiences to make her feel alive while her failing body struggles to keep up. The Hopewell Hotel, 75 years ago a stylish Upper East Side haunt, has fallen on hard times. Its proprietors, the Martin family, have let the last remaining employee go, and now it’s up to the four children, Spencer, Lola, Scarlett, and Marlene, to keep things afloat. Enter one Mrs. Amy Amberson, a flamboyant, mysterious guest, back in New York after a long absence, with some clandestine motives. Mrs. Amberson is to occupy the Empire Suite, just today entrusted to Scarlett as a “present” on her fifteenth birthday (a family tradition), for the entire summer, and keeping her happy will test Scarlett’s ingenious mettle. What follows is some utterly winning, madcap Manhattan farce, crafted with a winking, urbane narrative and tight, wry dialogue. Beneath the silvered surface, Johnson delivers a complex sibling relationship. Like the Hilary McKay’s Casson quartet, first introduced in Saffy’s Angel (2002), these siblings are bound by tender, poignant connections, all the more real for the absurdity of their circumstances. We can only hope that they, too, return for more intrepid adventures. Head over to over to Mrs. Magoo Reads. Become a follower because she has tons of awesome interviews and contest and book reviews. Just do it.Right now she's holding a contest to win NINE books! You can enter the contest here! Good luck. Jade is not her illness. She has been diagnosed with Panic Disorder, but she will not die. At night Jade sits and watches the elephant cam on her computer, a perk of moving to Seattle is the zoo. One night she sees a boy in a red jacket, a boy she has seen during the day with a kid. She wonders why he sneaks into the zoo to look at the elephants. After Jade tries to "accidentally" bump into him at the zoo a few times to no avail the elephant keeper offers to have her volunteer. Jade decides to swallow her fear and accept. While working she meets the mysterious red jacket boy (Sebastian) and his son (Bo). Even though Sebastian has a kid Jade thinks that falling in love with him is okay. When she digs into his past however, she finds some unsavory things. She has to decided should she stay or should she go? Should she tell her parents where she has really been going everyday? This was quite an enjoyable book. A new take on the old love story. You don't read too many girl likes boy, boy has son books, at least not YA. Each chapter starts off with a little Psychology snippet from Dr. Jerome R. Clade. I think this adds to the novel giving you some interesting tidbits. I always love learning things when I read and not being bored because all I'm doing is learning. This was still a great fun read. If you are not an animal lover however, you may be put off by how much Jade really loves the elephants. A lot of this book revolves around elephants and relates them to humans and their emotions. So that said, this book makes me glad to have read it and I feel a little bit wiser with the fun facts I learned about animals. Favorite Line: "The pain of being without him---butterflies crashing against rocks." As you know Stephanie Kuehnert's new book Ballads of Suburbia comes out TODAY! You all know who she is, and most of you love her, but do you really know her? Well I set out to ask Stephanie some question I know you want to know. So without further introduction here we go! Well, I'm answering this on Weds July 15 and today I am just exhausted. I spent the weekend at ALA and Monday was my birthday and I just haven't caught up on sleep or anything else since then. Book release time is a crazy time. But the day this posts, on book release day, I'm sure I will be both nervous and excited! What is the most influential book for you? What book hit you the hardest when you read it? This is really hard for me to answer because there were so many books that influenced me heavily throughout the years. Weetzie Bat by Francesca Lia Block is probably my all-time favorite YA and the book that inspired me to write for an audience of teens who feel different and sometimes isolated the way I did when I was a teen reading Weetzie Bat. Though of FLB's books the one that actually hit me the hardest was The Hanged Man. However there are other books that influenced me big time, too. The classics like The Grapes of Wrath and The Scarlet Letter. Contemporary fiction like Trainspotting by Irvine Welsh and Hairstyles of the Damned by Joe Meno. Speak by Laurie Halse Anderson probably hit me the hardest. Though there are books like Ink Exchange by Melissa Marr and Almost Home by Jessica Blank and Trainspotting by Irvine Welsh that have really hit me hard too. What is your favorite part about being a published Young Adult author? YA readers. They are some of the most passionate readers out there. Every time I hear from a reader and find out the impact my words had on them, it just blows me out of the water. It's the best part of the job. What are you afraid of, phobia wise? Failure and imperfection are probably my biggest fears. But phobia wise, spiders terrify me and centipedes. Anything with more than four legs is just freaky. What was the first thing you said or did when you found out I Wanna Be Your Joey Ramone was going to be published? I asked repeatedly if it was really happening. When my agent confirmed it was she said, "You're a published author. Call your mom and tell her." So I did exactly that. Then I called my fiance (who was just my boyfriend at the time). And then I called the Fiction Writing Department at Columbia College Chicago where I got my Masters and where a lot of my friends worked and told them. Where does your last name come from, nationality? It's German. If you are curious how to pronounce it, I explain that in a recent vlog I did which you can find here. What is your favorite recent-ish Young Adult book? Well, I love Melissa Marr's faerie series, so Fragile Eternity was probably my most recent fave. Though I just blurbed a book called Hollywood Ending by Kathy Charles that is coming out in September in Australia that I really really adore. I just saw The Wrestler on dvd. I don't get to the theater as often as I would like though hopefully by the time this posts I will have seen or be on my way to seeing the new Harry Potter! What would you like to tell the world? Break the silence. Talk about the hard stuff. Write songs or stories or poems about it. Make art about it. My whole goal with writing Ballads of Suburbia was to destroy the myth that the suburbs are safe and happy. I wanted to get people talk about about things like addiction and self-injury and depression because the only way we heal and solve problems is my talking or expressing ourselves. So Thank You Stephanie and people so ahead and check out here blog here and today go buy Ballads of Suburbia, wherever you get your books, you won't regret it! You can check out my review of it here. 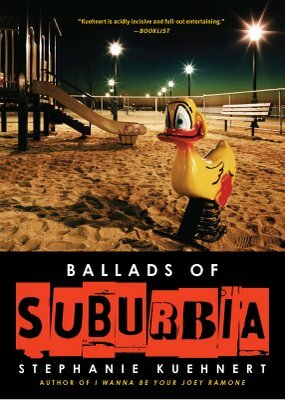 In honor of Stephanie's book release I am going to be giving away 1 brand spankin' new copy of Ballads of Suburbia to a lucky winner! All you have to do is comment below with your e-mail address and tell me why you want to read this. Contest ends August 18th or when 50 people enter whichever comes first. Sorry I didn't put this before but contest IS international. This sounds like a very interesting premise, sort of "scary real". I think it's neat that it's a story told from the girlfriends point of view, not the shooter's or a victim's. Only a couple more months! Mini and her sister Kate have bad names (which I won't disclose here) and so they use their nicknames. They have always been really close, they even have a secret travel game that they play since Mini is such an Ace at geography. One day though, Kate starts acting strange, she comes home late, she cries a lot. Mini has no idea what's going on with her sister. Her parents ask Mini if she and Kate have any secrets, trying to figure out what is going on, although they kind of already know. One day Kate disappears and the police are called and everything. Mini doesn't know what to do, so she talks to this kid Satch(not his real name) and it turns out that he's a great listener. Kate gets home but not long after she disappears again and this time no one knows where she's gone, or do they? Before Kate left she put a pebble in Mini's bed, now it's up to Mini to piece things together and bring Kate home before Mini has to have her thirteenth birthday without her. I enjoyed this story, it seemed very realistic, especially with Mini being a geography nerd and at the age where she not that ashamed of it yet and can still enjoy it fully. There are lots of geography facts in the beginning half of the book, and I wish they could have worked more into the last half. I like how simple Mini can be because she's only twelve and doesn't really know everything that's going on or has gone on. There's not a whole lot I can say about this book except that I enjoyed it and was dying to know Mini's name by the end. I suggest you read it. It's only 135 pages so it's a quick and delightful read. This kind of reminds me of Feed by: M.T. Anderson. What do you think? This week's Teaser Tuesday is from The Nature of Jade by: Deb Caletti. "The elephant likes you. He sniffed your hair." A terrible storm is raging, and ten-year-old Dinah is huddled by candlelight with her brother, sister, and cousin Gage, who is telling a very unusual tale. It’s the story of What-the-Dickens, a newly hatched orphan creature who finds he has an attraction to teeth, a crush on a cat named McCavity, and a penchant for getting into trouble. One day he happens upon a feisty girl skibberee who is working as an Agent of Change — trading coins for teeth — and learns that there is a dutiful tribe of skibbereen (call them tooth fairies) to which he hopes to belong. As his tale of discovery unfolds, however, both What-the- Dickens and Dinah come to see that the world is both richer and less sure than they ever imagined. The first installment of this creepy, campy paperback original series introduces the psychic Giordano sisters—and their very strange hometown, Nightshade, California. Dead is the New Black is a fast-paced mystery that combines romance, humor, sibling rivalry, and lots of attitude. When Auden decides to spend the summer before college with her father and stepmother in a small beach town, she finds herself freed to discover a new world of friendship with other girls, as well as an unexpected romance with Eli, a rising star on the BMX circuit and a fellow insomniac, who joins her in exploring the late night world of the small town. As Auden struggles to turn from the path her mother has set for her and Eli tries to come to terms with the death of a friend for which he holds himself responsible, the two break out of their mutual self-imposed isolation and find one another. Katniss is a 16-year-old girl living with her mother and younger sister in the poorest district of Panem, the remains of what used be the United States. Long ago the districts waged war on the Capitol and were defeated. As part of the surrender terms, each district agreed to send one boy and one girl to appear in an annual televised event called, "The Hunger Games." The terrain, rules, and level of audience participation may change but one thing is constant: kill or be killed. When Kat's sister is chosen by lottery, Kat steps up to go in her place. Jumping Off Swings tells, from four points of view, the ramifications of a pregnancy resulting from a "one-time thing" between Ellie, who feels loved when boys touch her and Josh, an eager virgin with a troubled home life. Belinda Hollyer warms the heart with this touching novel about the bond of two sisters and the true meaning of family. Mini adores her older sister, Kate. Although they look nothing like each other, they are best friends-or so Mini thinks-until Kate begins to act strangely. She dresses in all black, picks bitter fights with her parents, and even gets a tattoo! Mini knows something is bothering her sister, but Kate won't confide in her like she used to. Then one day Kate disappears without a trace. In her determination to find her sister, Mini unveils a shocking family secret that paralyzes her parents with regret. Now it's up to Mini to find Kate and bring their broken family back together again. Claire has dreams, not like everyone else does though. The things she sees in her dreams she witnesses again in real life. She's not sure why she sees them though and after her grandmother, Kiki, gives her a cameo necklace she begins to dream more often, and in black and white. On top of all this Claire is starting at a new school, and doesn't really have any friends going into it. One day she sees an airplane ring and decides she wants to know the girl who's hand it's on. The girl's name is Becca Shuttleworth, like the Shuttleworth ketchup industry. This book takes you through all the ups, downs, ins and outs Claire has to go through with new friends, detective work, and old grudges. This book started off interesting enough, Claire following one of her dreams, but eventually it got semi-unrealistic. The mystery/detective part was still good, but the "real life" part didn't seem to be flowing as nicely. Then it all got good again when the pieces of the mystery started to come together, but then the ending was like a cheesy teen flick. I really enjoyed the whole she dreams clues that she has to figure out and put together to solve a mysterything. I would definitely say this is a good summer read because it's light, fun and a very quick read. I wish there was more of the mystery part of the book though, and maybe some of the real life bits, but the real life bits in this book just didn't work out. They were very abrupt and you didn't really know the whole story. If this was a sequel that would make more sense, because then you would already know the background and so the grudges and snip-its of the past would be familiar instead of just randomly thrown in. All in all this was a decent read, something you can pick up and breeze through. Happy Birthday to me and my first Waiting on Wednesday! I really want to read this I loved the Gemma Doyle Series. Doesn't this cover just strike you as so bizarre? Why is the lawn gnome wearing sunglasses?!?! Have you ever wondered what happened to Jesus in the years between 3 and 33? Here's your chance to find out! Straight from his best friends hand you will read what went on in those years that the bible omits. How is this possible? Well, an angel named Raziel goes and resurrects Biff after 2,000 years of being dead an tells him he is to write what happened as far as he knows. So read this and you'll learn the origins of words, you'll learn that Jesus was actually called Joshua and Jesus is just a Greek Translation of the Hebrew Yeshua(Joshua). This shows the struggle Josh had to endure while putting up with his best friend Biff along with some other dimwits, and how he went on tho become the messiah he always knew he was. I love Christopher Moore. His books have a clever humor in them and I just love it. This book was great because he did a lot of research and so it really rings true. Biff and Joseph end up seeking out the three wise men in this, because Joshua feels each of them have something to teach him. So they leave home one day and over the next seventeen years, they learn all they can(not with out a bit of complaining, if not mostly from Biff). This book shows Josh and Biff as just two normal guys one who just happens to be the savior, but they act like normal people (save for a few miracles here and there) and they still have feelings and yell a lot. This book is very fun and realistic and I think a lot of people can enjoy it. It's a good book for those on the 16+ side of the YA spectrum, even though it's an adult book I really do think older teens and up will love it. Lauren is dating Dave. Let's review that shall we Lauren (a nobody) is dating Dave (the somebody, the football star the Mr. Popular). Her best friend is Katie who is dating Dave's best friend Marcus. Lauren doesn't have a mom she left when Lauren was young. Her dad has been trying to fill that gap with girlfriend after girlfriend, but he just can't seem to make it work. One of these relationships was with a woman named Mary and included her son Evan. Like all the others Mary left soon after moving in. Now many moons later Lauren gets sat next to none other than Evan who has just come back from wherever it is he's been all these years. Seeing him Lauren starts to feel for him things she doesn't understand and most certainly never felt when she was with Dave. Even though everyone says that she and Dave are "perfect" together, Lauren just feels like a big liar, a big fake who is just going through the motions with kind, sensitive caring, Dave. Now for the first time Lauren has to decide what she wants and she has to make it so. Okay, so I did enjoy this book, it was light and funny and at the same time touched upon some basic teen issues. I felt like Lauren was a genuine person, a real teen with a real teen dilemma. However, I didn't feel like the plot went anywhere for the first half of the book. Each chapter seemed to just be the same thing just different words and a few extra details. Nothing really happened. Though this did hamper my reading a bit, it did not deter me because it was still light enough to be enjoyable. I definitely recommend this to girls for the summer. It's a fast, delectable read that I think most girls will be ale to relate to. So yeah read it, you'll love it.